In March of 2014 we faithful saw Modano’s number hung in the rafter during a tear-filled retirement ceremony – not a dry eye in the house! There are those of us, though who believe it was only the start to what this organization owes to it’s history. 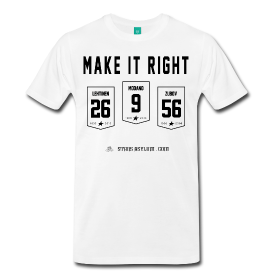 On the heels of hearing Bob Sturm talking about Zubov deserving the rafters and ESPN talking about him deserving the Hall of Fame, we want you to have a way to show your support and ask the organization to make it right – let’s get Zubov and Lehtinen up in the rafters, LEHTS #MAKEITRIGHT! We have one great player with his name in the rafters, Now it’s time to MAKE IT RIGHT! There should be 2 other names up there too!